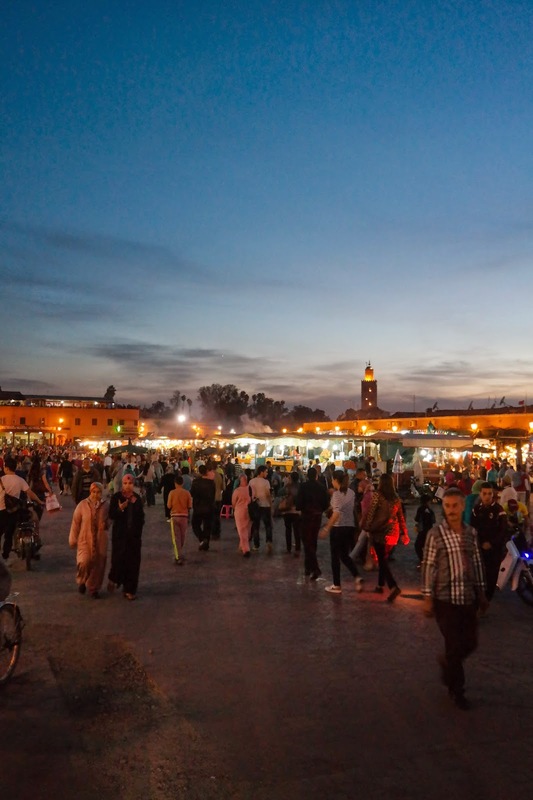 Just as no tourist trip to Marrakech is complete without a trip to the Jemaa El Fna, the main square at the heart of the Medina, no foodie trip to Marrakech is complete without tucking into the food sold there in prodigious great quantities each night. By day, the square is a raucous cacophony of snake charmers, Bedouin or Berber dancers, stalls flogging the usual tourist tat – from cheap fez caps (which can be acquired for no more than a couple of quid if you're firm with your haggling) to herbal and mineral remedies to mini tagines and lanterns to false teeth (seriously, get your dentures here on the cheap). By night its much the same, albeit a touch edgier. The snake charmers and belly dancers are still there, but they're joined by gambling games and bareknuckle boxers. 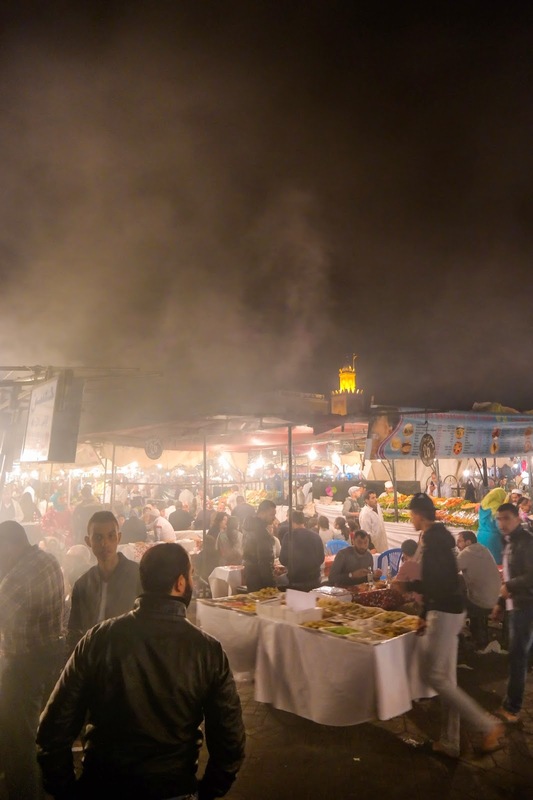 But the biggest transformation has to be the food stalls that pop up around dusk and take over a good third of this large public thoroughfare. The air fills with charcoal smoke and chaos. 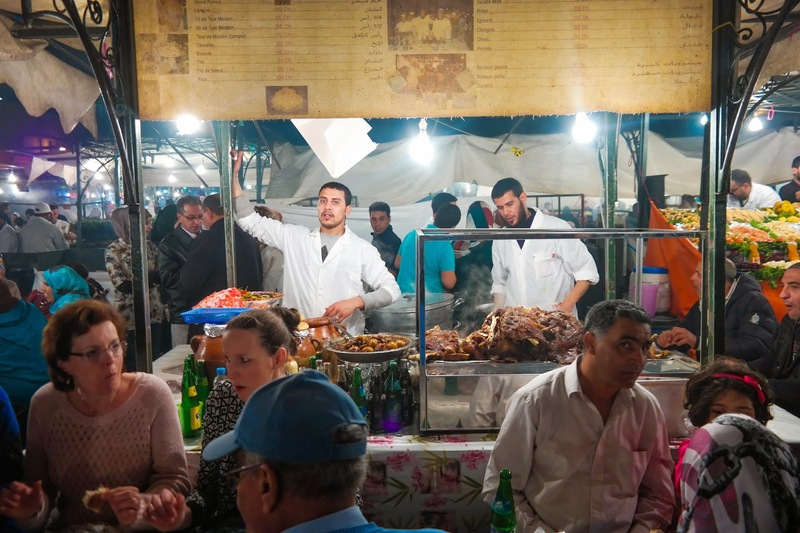 Hundreds of people – mostly local – descend upon the square for an honest, cheap supper. I read somewhere that this is one of the largest outside eateries in the world. With 60 to 70 stalls (highly unscientific guesstimate, based on the numbering system, about which I will say more below) I can well believe this. The one thing you have to be prepared for is the craziness. And this is CRAY-CRAY-ZEE. Seriously. 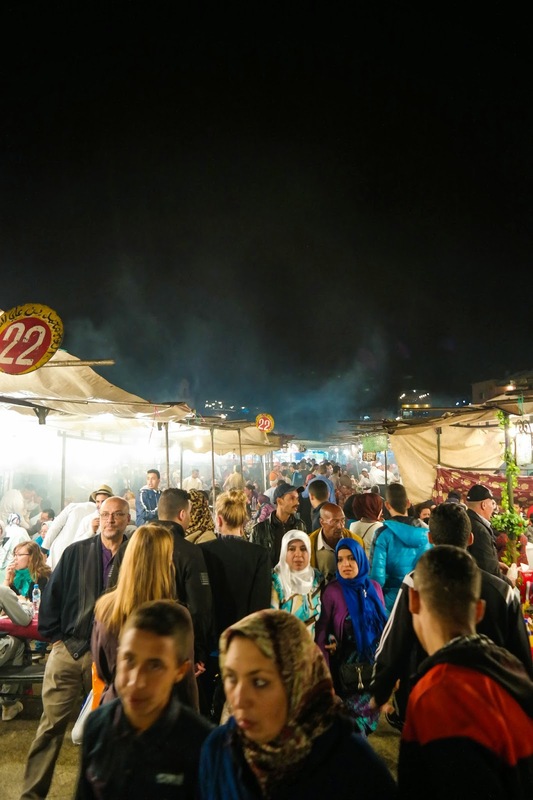 It's rammed – even in such a big space – and the hustle, bustle and haggle going on is completely on another level. 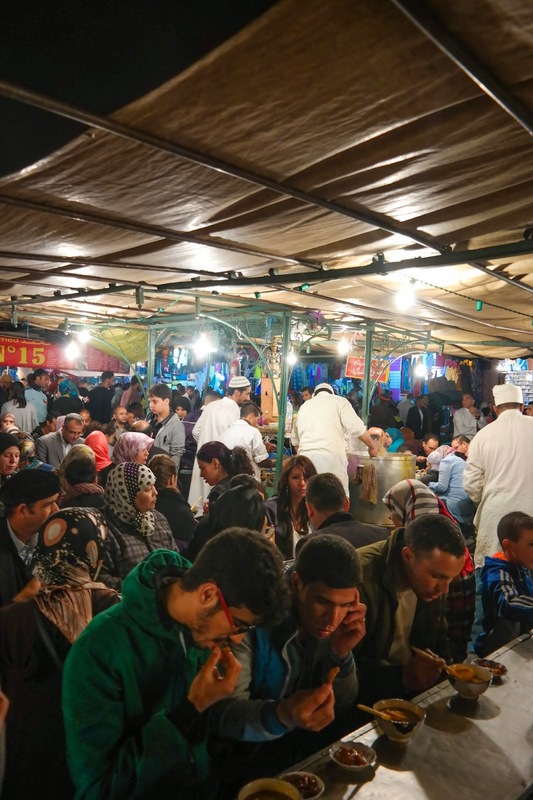 Even if you've been in Marrakech a few days and made your way through the souks (which are similarly bonkers) I still recommend that you brace yourself before diving into the narrow alleyways between the Jemaa's food stalls. 3. Mixed Grill (the biggest and most popular offering). We went for the latter. 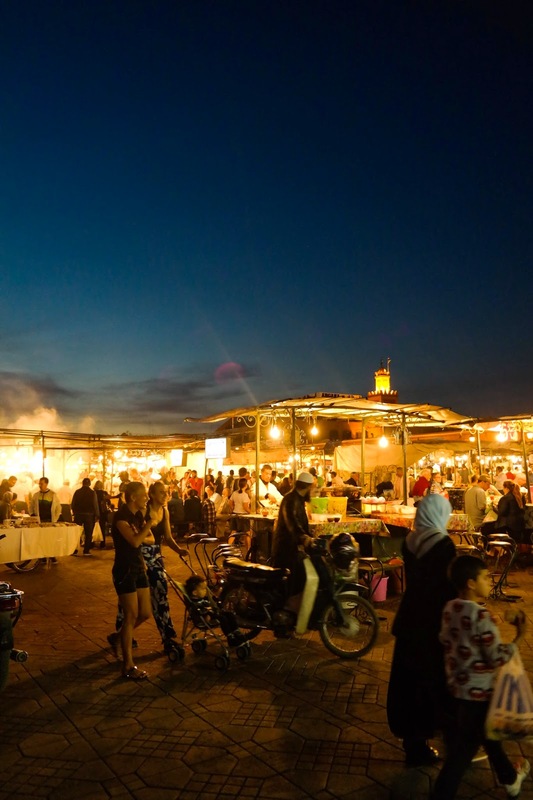 Once you've decided on your cuisine for the evening (and honestly, you don’t really need to decide – there's nothing to stop you digging in at lots of different stalls and so trying a bit of everything) you need to decide which eatery you're going to patronise for the evening. This is where, in the other sense, there's an almost bewildering number of options. You remember I mentioned the numbering system? Well, here's where it comes into play. You see, each stall is numbered. 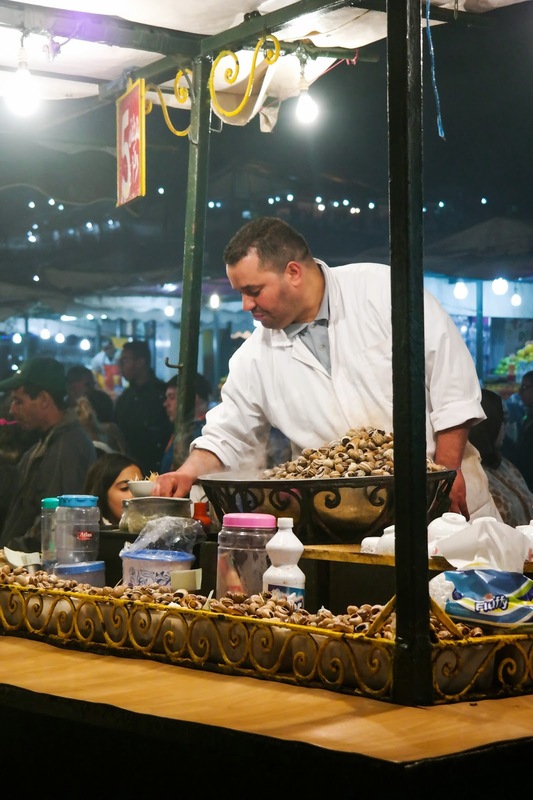 There's a separate set of numbering for every kind of stall – whether it's grilled meat, eggs, snails, orange juice, fruit and nuts or tea, they all have a set of numbers identifying each stall starting with one. In the case of the grills, they can go pretty high. In the case of the snails, there are only four or five. Here are some examples. Knowing where to go is key, I'm told, as some of the stalls are dodgier than others, and some are (apparently) much better than others. 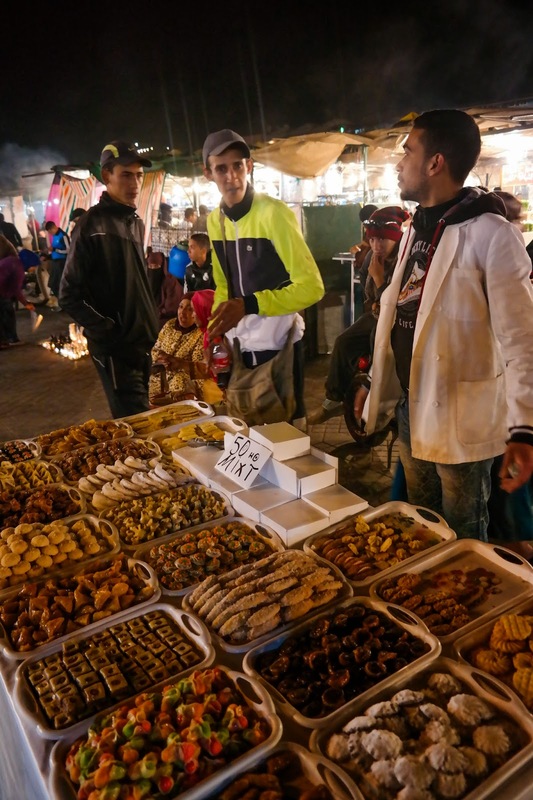 As you wander through the 'alleyways' you'll be accosted by dozens of young men trying to sell their stalls. 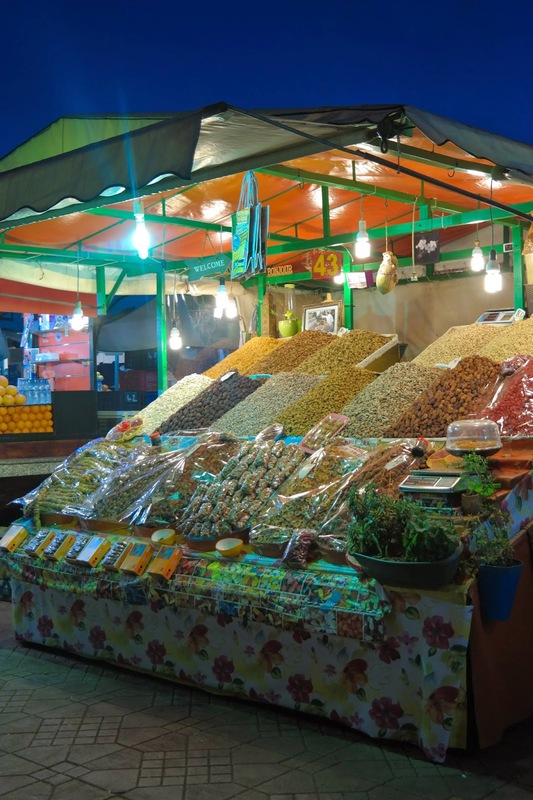 Some will claim theirs is "the best in Marrakech!" Others will, perhaps more honestly, cry out that their stall sells "the same old craps as everyone else!" 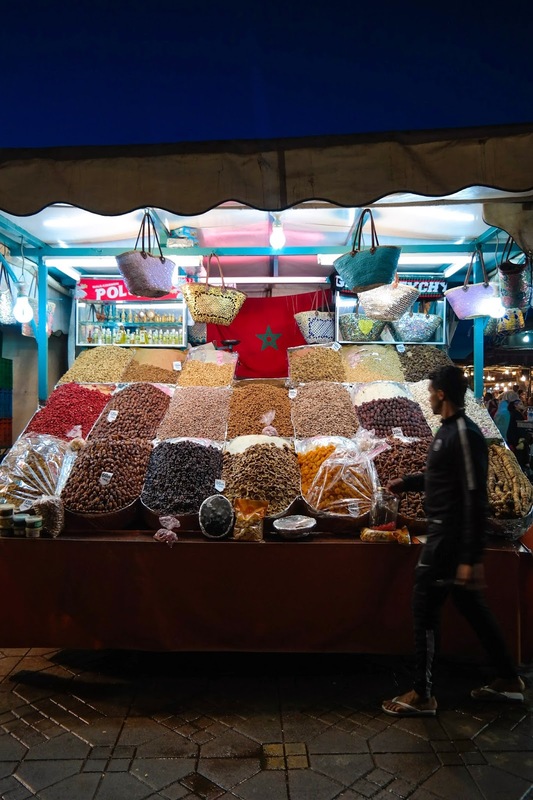 How you are supposed to get a handle on this, I don't know – we went with a tip from our riad owner, who's lived in Marrakech for 11 years. So I guess, if anyone, she's likely to know. She recommended stalls 1 and 14. We plumped for Number 1. 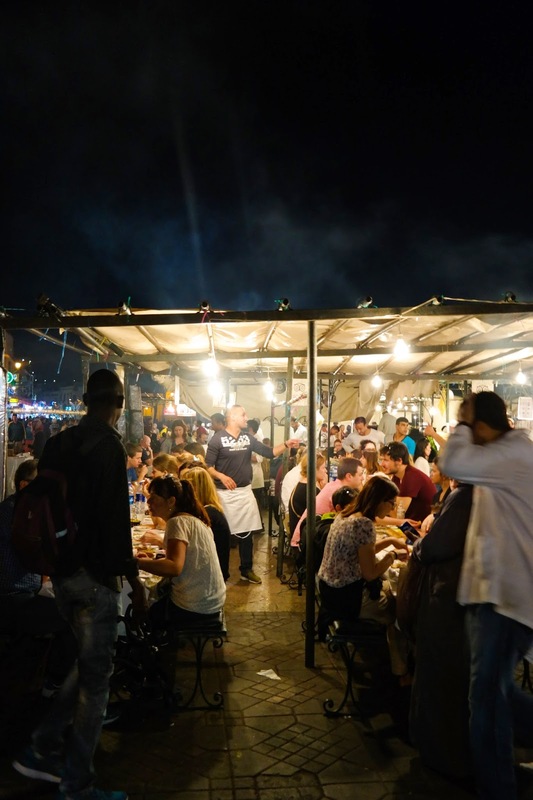 Once you've picked your stall, one of the stall hawkers will usher you to a seat, thrust a greasy menu under your nose and take your order. We dived in. it's very easy to over order, by the way. Honest. 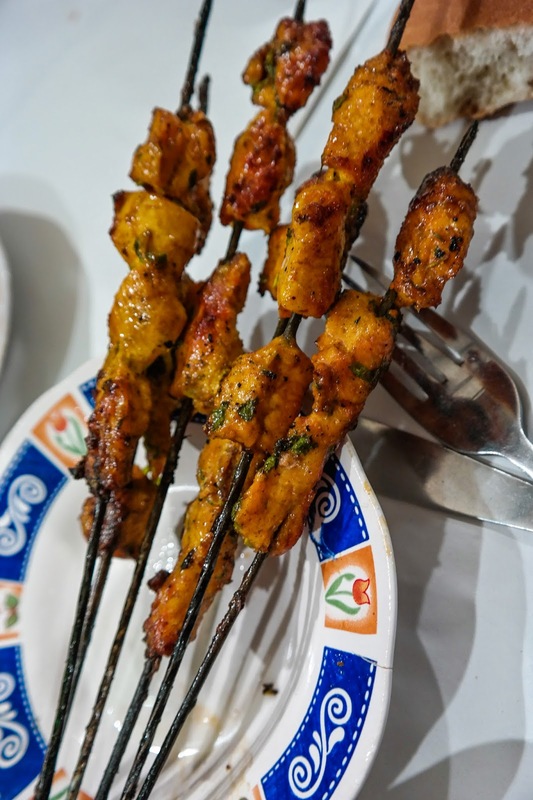 It's cheap as chips – so cheap, for example, that we assumed that an order of chicken brochette contained just one brochette. It actually contained six. First up, fried aubergine. Delicious, end of. 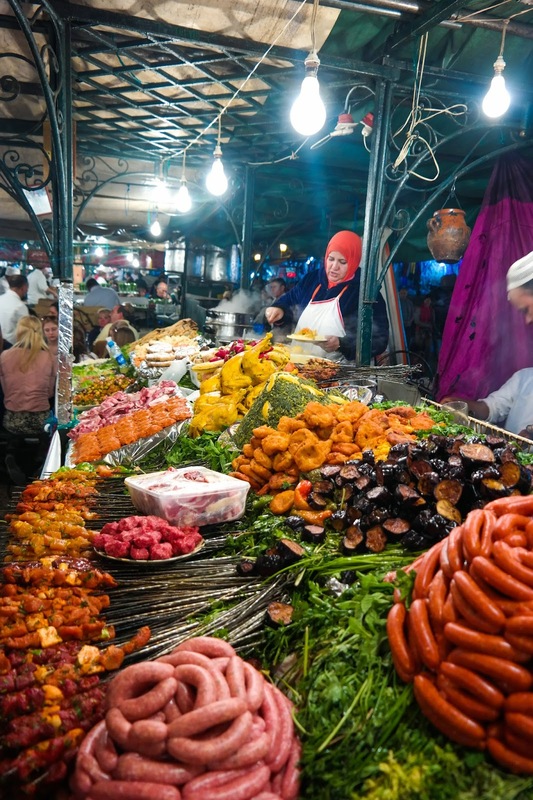 The produce in Morocco is (largely) very fresh and tasty, and this was no exception. Aubergine takes well to being fried and this stuff was clearly grilled a little as well afterwards, as it had a smoky tinge. 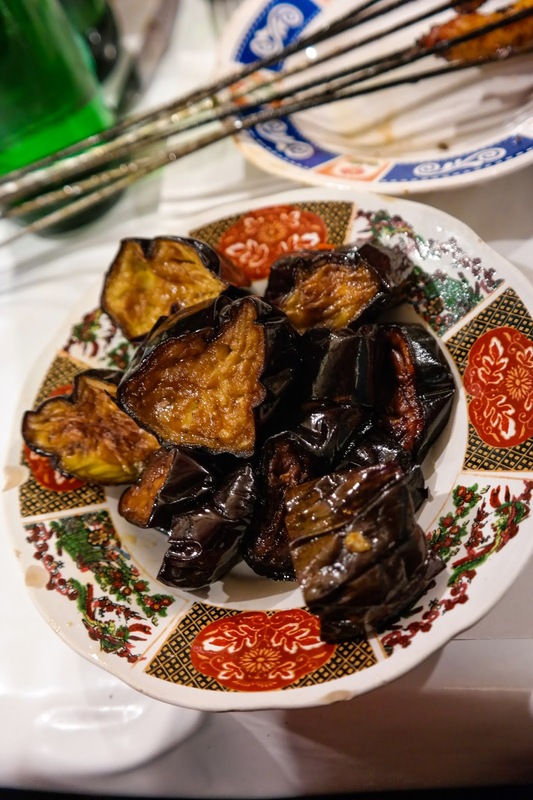 Aubergine and smoke works well together – think of baba ghanoush. There was also some spinach topped with marinated olives. Avoid this. GrubsterGirl said it tasted like grass. I thought it looked suspiciously like the stuff that comes out of my Dad's mulch mower and tasted pretty much what I imagine that mulch tastes like. A rare miss. 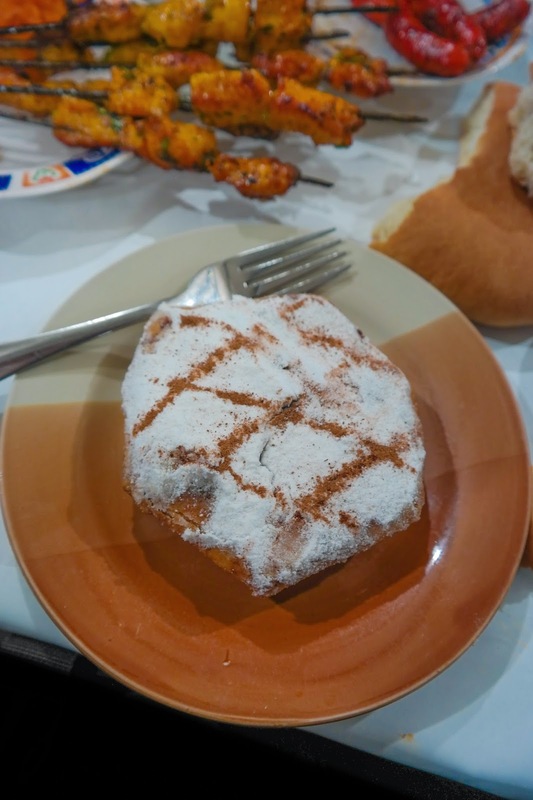 We also had fritters, described on the French menu as beignet. Nothing like the beignet of New Orleans (in hindsight, what on earth was I honestly expecting?) 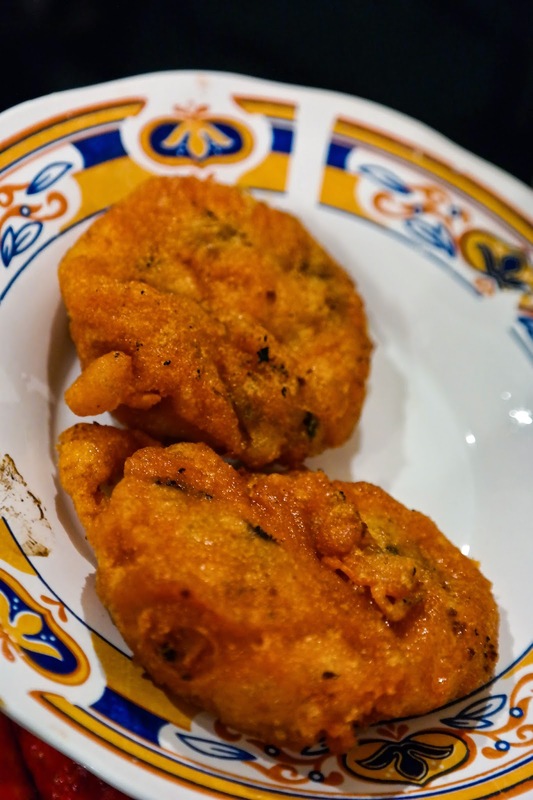 these were sort of vegetable and dough fritters. Again, could have left out, but not offensive. GrubsterGirl enjoyed them. On to the MEAT. This is what we're here for, right? First up, chicken brochettes, which I have already mentioned. These were yums. The chicken was smoky and charry, as one would expect having been cooked over hot coals. It was also highly spiced and highly tasty, with the chicken remaining good and moist, despite the searing. Next up, koftas. Lamb or beef? No idea – seriously. 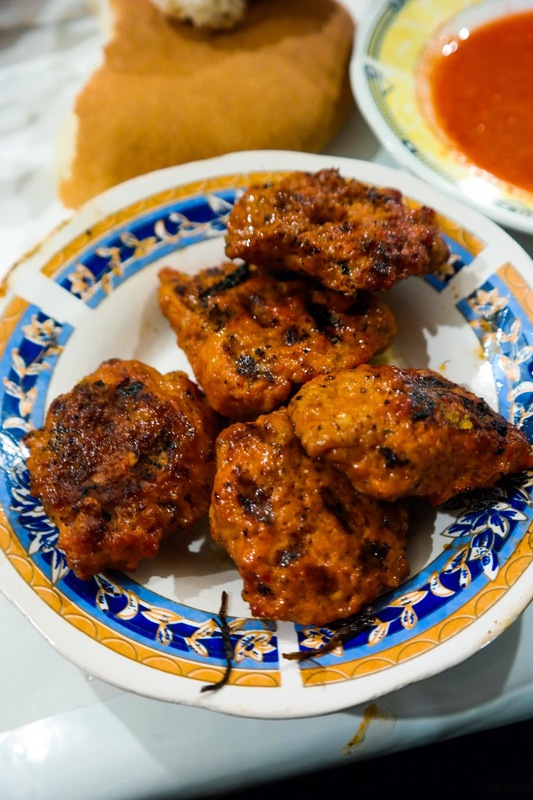 You might think it’s easy to tell the difference between them, but that aint always true, especially when they're spiced and grilled to perfection the way these were. I ere on the side of lamb, but I won’t be placing any cash on that. But, importantly, they were great. Not even the slightest hint of gristle, which so often accompanies cheap minced meats. Then there were the merguez. Or mini sausages to you and me. Merguez in fact are more commonly spiced beef sausages, but our batch seemed to be mixed – no bad thing, seeing how they were all equally tasty. 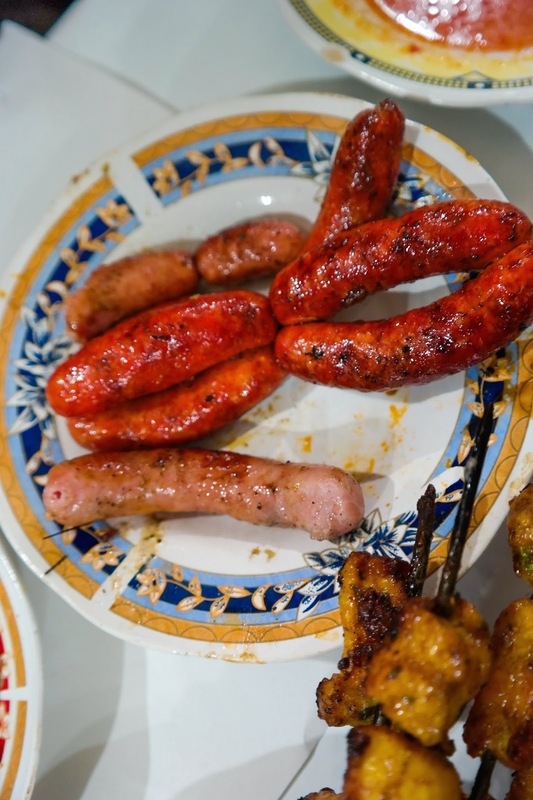 Being an Englishman through and through, I love a barbequed sausage – the only thing missing was the perpetual drizzle of any English summer day that inspires a BBQ. These were, needless to say, a far cry from your English barbequed banger, but they were very yummy too. Fresh off the grill they oozed sausagey goodness. 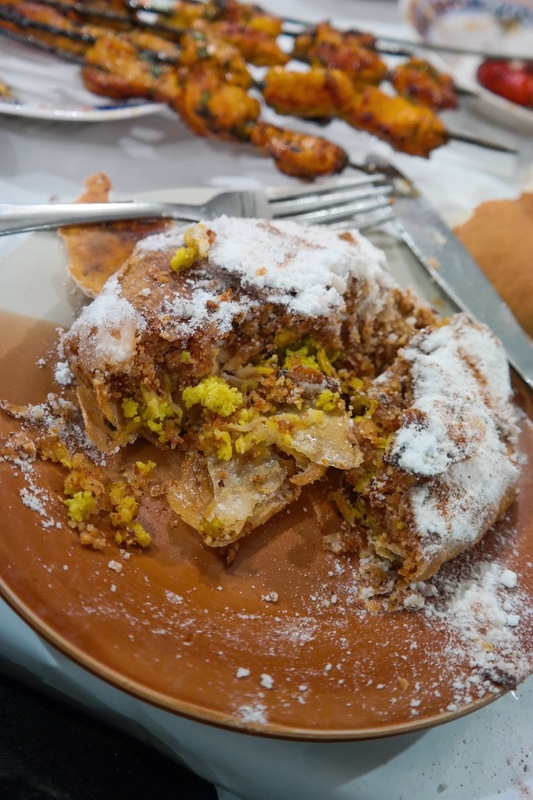 This is a Moroccan staple, a filo pie stuffed with pigeon and alsmonds (and, in this case, peanuts too), flavoured with cinnamon and dusted with icing sugar. It's the kind of dish that doesn’t know whether it’s coming of going, whether it's a savoury snack or a sweet pudding. And it's neither, in a way. It's nice, sure, but confusing – and I like the whole sweet and savoury thing, honestly – but this is just too confused. And it’s also a bit dry. And, paradoxically (given its eclectic range of ingredients), a little bit dull. 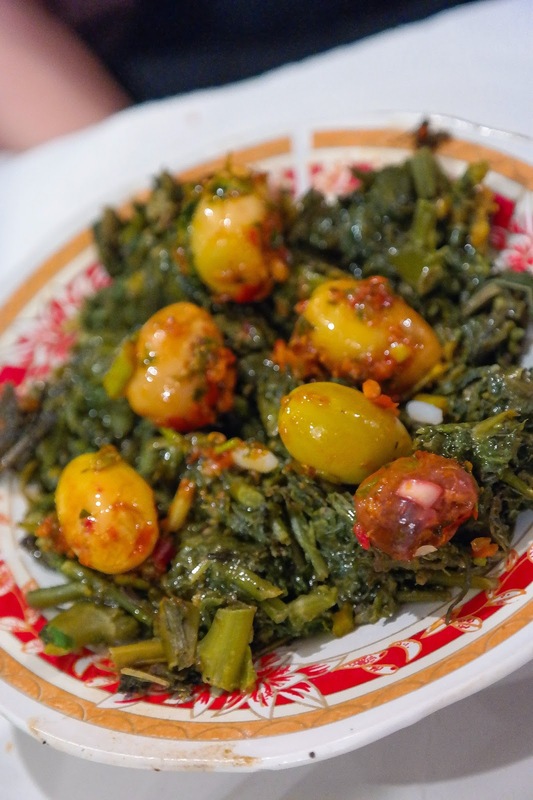 I could take it or leave it, if I'm honest – but definitely worth a try given it's status in Moroccan cuisine. 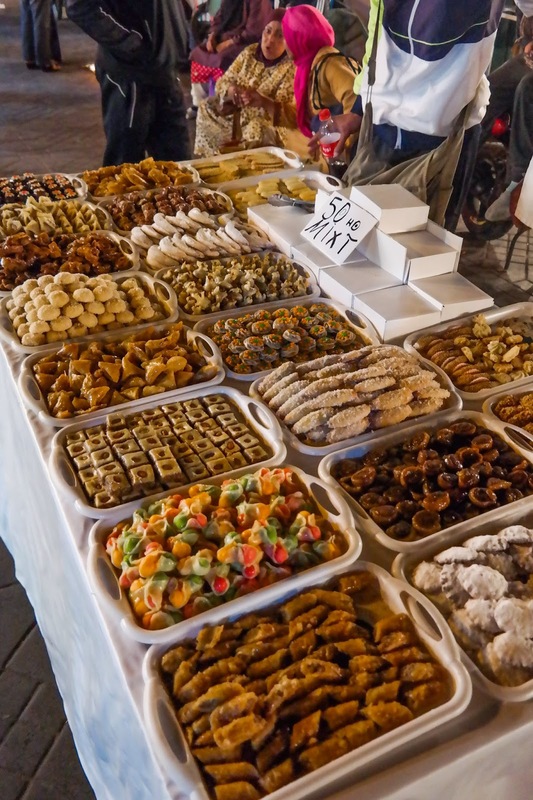 ...or the abundant handcarts overladen with pastry treats. Much like baklava, these morsels of filo pastry, nuts and honey are a sweet and satisfying end to a meal. The of course you just have to wash it all down with a glass of the ubiquitous orange juice that's dotted around the square. 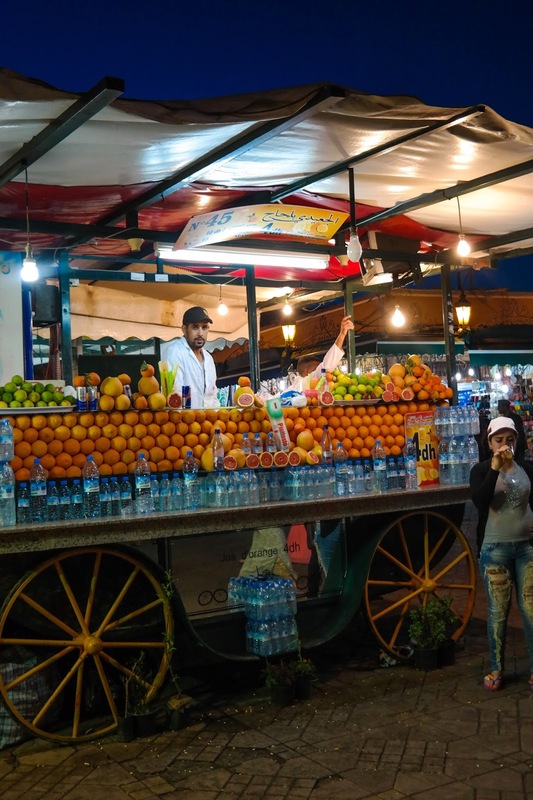 Once again, head for a stall that's being patronised by locals, as that way you're more likely to get pure juice rather than watered down mix. Some locals go for it with a spoonful of sugar in, which... 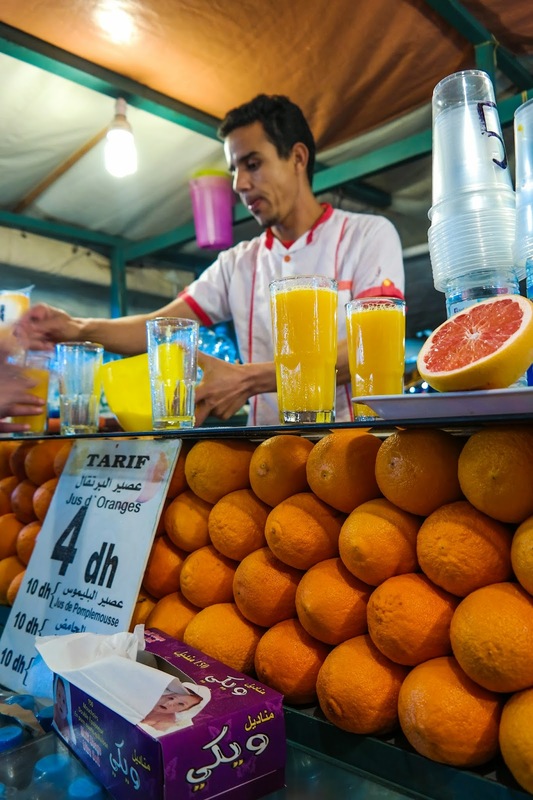 I just can't... Also, most stalls will flog you grapefruit or lemon juice as an alternative, but at 28p a glass of OJ, you can't really go wrong with the original stuff. And to finish the night? 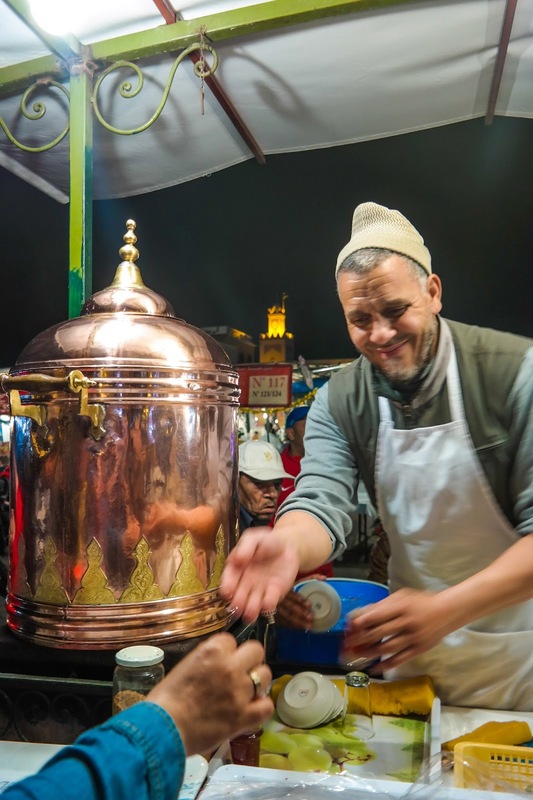 Well, there's a large number of stalls along the western side of the market selling khoudenjal from huge copper samovars. We thought it might be mint tea. But instead we got a tea of cinnamon, mace, galangal, ginger, cloves, nutmeg, black pepper and star anise. There is also plenty of sugar in there (no surprises). It was delicious, but quite a potent mixture to get through. It was only on returning to the UK and looking it up that I discovered that this drink is colloquially known as 'Morrocan Viagra' and is said to be a potent aphrodisiac. Oh well. No harm done. 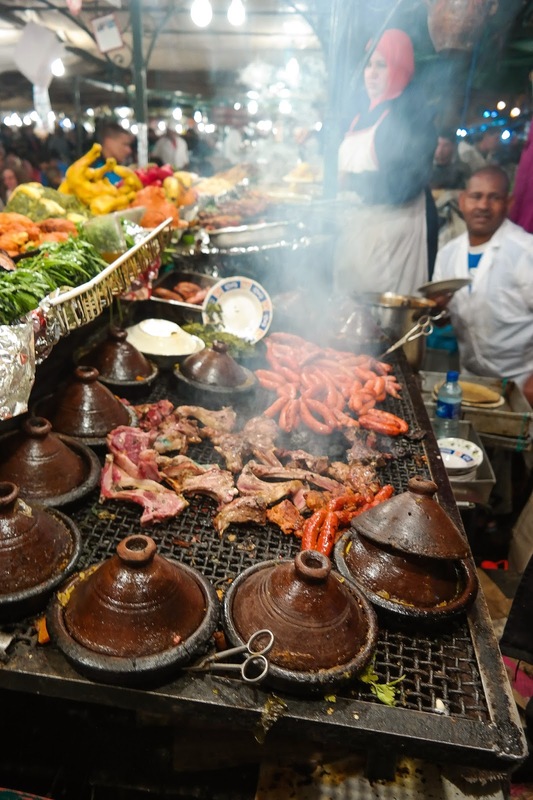 The Jemaa El Fna is a food experience like no other I have ever experienced. 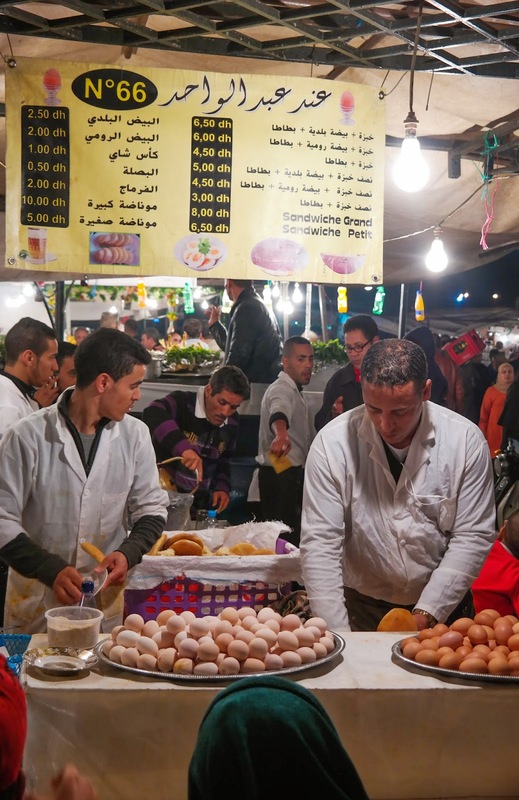 It's bonkers, literally, but the food is good, cheap and hugely varied. 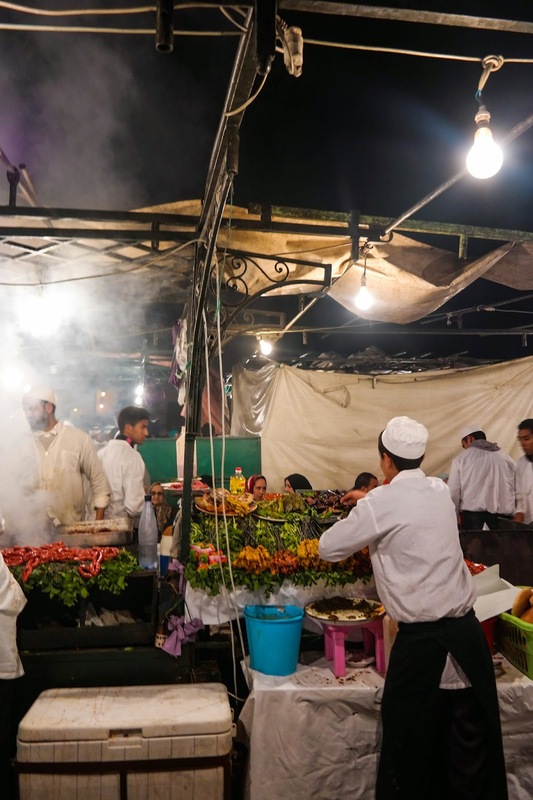 I expect many travellers take one look and see nothing but endless bouts of food poisoning, but frankly everything seemed clean and well ordered. 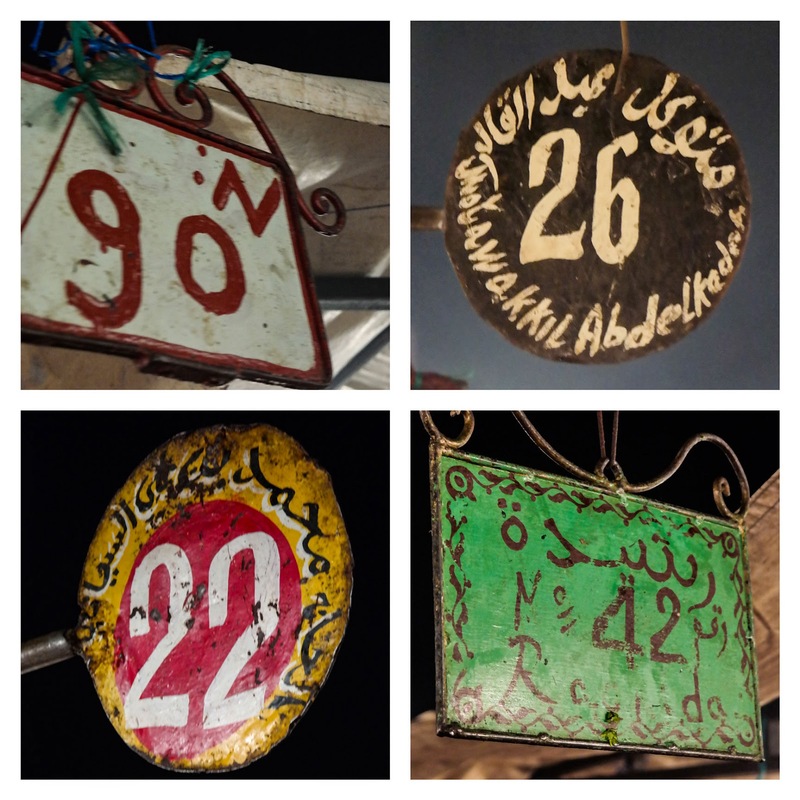 It was a great evening and I recommend it to anyone travelling to Marrakech.